As I understand it, when inside a factory I return an object that gets injected into a controller. When inside a service I am dealing with the object using this and not returning anything. I was under the assumption that a service was always a singleton, and that a new factory object gets injected in every controller. However, as it turns out, a factory object is a singleton too? When changing user.first in ACtrl it turns out that user.first in BCtrl is also changed, e.g. User is a singleton? My assumption was that a new instance was injected in a controller with a factory? Lastly, it is important to realize that all Angular services are application singletons. This means that there is only one instance of a given service per injector. For me the revelation came when I realise that they all work the same way: by running something once, storing the value they get, and then cough up that same stored value when referenced through Dependency Injection. This is why we use this in services, and define a this.$get in providers. return "Hello, " + name + "!" //hey, we can configure a provider! Result: When declaring serviceName as an injectable argument you will be provided with the instance of a function passed to module.service. Usage: Could be useful for sharing utility functions that are useful to invoke by simply appending () to the injected function reference. Could also be run with injectedArg.call( this ) or similar. Result: When declaring factoryName as an injectable argument you will be provided the value that is returned by invoking the function reference passed to module.factory. Usage: Could be useful for returning a 'class' function that can then be new'ed to create instances. Also check AngularJS documentation and similar question on stackoverflow confused about service vs factory. Here is example using services and factory. Read more about AngularJS service vs factory. Adding to the first answer, I think .service() is for people who have written their code in more object oriented style(C#/Java) (using this keyword and instantiating object via prototype/Constructor function). Both get invoked once resulting in a singleton object that gets injected into other components of your app. All providers work the same way. The different methods service, factory, provider just let you accomplish the same thing in less code. P.S. There's also value and constant. Each special case down the chain starting with provider and ending with value has an added limitation. So to decide between them you have to ask yourself which let's you accomplish what you want with less code. Here are some more examples of services vs factories which may be useful in seeing the difference between them. Basically, a service has "new ..." called on it, it is already instantiated. A factory is not instantiated automatically. The output in both cases is the same, the list of numbers. “Factory” and “Service” are different ways of doing DI (Dependency injection) in angular. So when we define DI using “service” as shown in the code below. This creates a new GLOBAL instance of the “Logger” object and injects it in to the function. When you define DI using a “factory” it does not create a instance. It just passes the method and later the consumer internally has to make calls to the factory for object instances. Below is a simple image which shows visually how DI process for “Service” is different than “Factory”. Service should be used When we have utility or shared functions to be injected like Utility , Logger , Error handler etc. Service style: (probably the simplest one) returns the actual function: Useful for sharing utility functions that are useful to invoke by simply appending () to the injected function reference. Factory style: (more involved but more sophisticated) returns the function's return value: instantiate an object like new Object() in java. Factory is a function that creates values. When a service, controller etc. needs a value injected from a factory, the factory creates the value on demand. Once created, the value is reused for all services, controllers etc. which need it injected. Provider style: (full blown, configurable version) returns the output of the function's $get function: Configurable. Providers in AngularJS is the most flexible form of factory you can create. You register a provider with a module just like you do with a service or factory, except you use the provider() function instead. The basic difference, is that provider allows to set primitive (non-objects), array, or callback function values into the factory declared variable, and thus if returning an object it has to be explicitly declared and returned. On the other hand a service can only be used to set the service declared variable to an object, thus we can avoid the explicit creation and returning of the objects, while on the other hand it allows usage of the this keyword. Or in short words "provider is a more generic form while service is limited to objects only". Service: Return a type, that will be newed to create an object of that type. If Java analogy is used, Service returns a Java Class definition. Factory: Returns a concrete object that can be immediately used. In Java Analogy a Factory returns a Java Object. The part that often confuses people (including myself) is that when you inject a Service or a Factory in your code they can be used the same way, what you get in your code in both cases is a concrete object that you can immediately invoke. Which means in case of the Service, angular calls "new" on the service declaration on behalf of you. I think this is a convoluted concept. When declaring serviceName as an injectable argument you will be provided with an instance of the function. In other words new FunctionYouPassedToService(). This object instance becomes the service object that AngularJS registers and injects later to other services / controllers if required. When declaring factoryName as an injectable argument you will be provided with the value that is returned by invoking the function reference passed to module.factory. In below example we define MyService in two different ways. Note how in .service we create service methods using this.methodname. In .factory we created a factory object and assigned the methods to it. Again, .factory() is a method on our module and it also takes a name and a function, that defines the factory. We can inject and use that thing exactly the same way we did with the service. Now what is the difference here? Well, you might see that instead of working with this in the factory, we’re returning an object literal. Why is that? It turns out, a service is a constructor function whereas a factory is not. Somewhere deep inside of this Angular world, there’s this code that calls Object.create() with the service constructor function, when it gets instantiated. However, a factory function is really just a function that gets called, which is why we have to return an object explicitly. "There are comments in the code illustrating the primary differences but I will expand on them a bit here. As a note, I am just getting my head around this so if I say anything that is wrong please let me know. Result: When declaring serviceName as an injectable argument you will be provided the actual function reference passed to module.service. Result: When declaring providerName as an injectable argument you will be provided the value that is returned by invoking the $get method of the function reference passed to module.provider. I had this confusion for a while and I'm trying my best to provide a simple explanation here. Hope this will help! angular .factory and angular .service both are used to initialize a service and work in the same way. The only difference is, how you want to initialize your service. If you would like to initialize your service from a function that you have with a return value, you have to use this factory method. Singleton - called only once, stored, and pass the same object. If you would like to initialize your service from a constructor function (using this keyword), you have to use this service method. NOTE: If you use factory with <constructor function> or service with <function with a return value>, it will not work. This is what helped me to understand the difference, thanks to a blog post by Pascal Precht. A service is a method on a module that takes a name and a function that defines the service. You can inject and use that particular service in other components, like controllers, directives and filters. A factory is a method on a module and it also takes a name and a function, that defines the factory. We can also inject and use the it same way we did with the service. Objects created with new use the value of the prototype property of their constructor function as their prototype, so I found the Angular code that calls Object.create(), that I believe is the service constructor function when it gets instantiated. However, a factory function is really just a function that gets called, which is why we have to return an object literal for the factory. It takes the name and the factory function that is passed and returns a provider with the same name, that has a $get method which is our factory function. Whenever you ask the injector for a specific dependency, it basically asks the corresponding provider for an instance of that service, by calling the $get() method. That’s why $get() is required, when creating providers. Here is the angular 1.5 code for service. It turns out that when we call service(), it actually calls factory()! However, it doesn’t just pass our service constructor function to the factory as is. It also passes a function that asks the injector to instantiate an object by the given constructor. 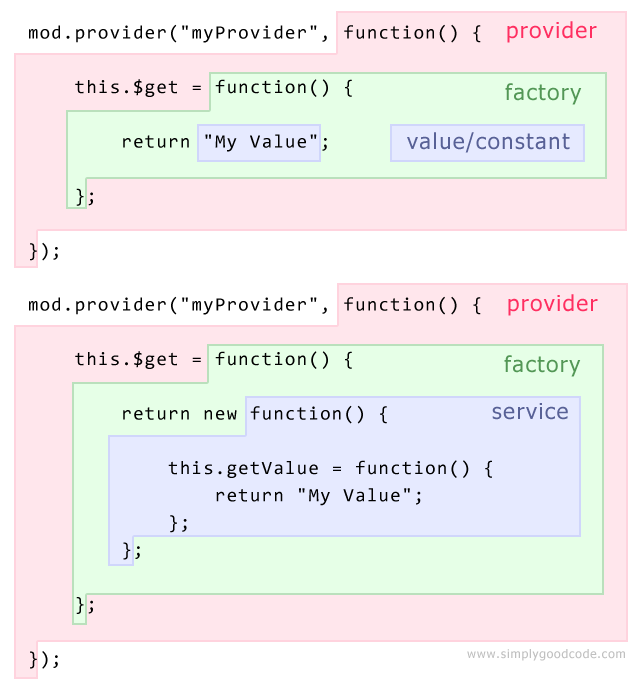 To restate it again, a service calls a factory, which is a $get() method on the corresponding provider. Moreover, $injector.instantiate() is the method that ultimately calls Object.create() with the constructor function. That’s why we use "this" in services. For ES5 it doesn't matter which we use: service() or factory(), it’s always a factory that is called which creates a provider for our service. You can do the exact same thing with services as well though. A service is a constructor function, however, that doesn’t prevent us from returning object literals. So we can take our service code and write it in a way that it basically does the exact same thing as our factory or in other words, you can write a service as a factory to return an object. Why do most people recommend to use factories over services? This is the best answer I've seen which comes from Pawel Kozlowski's book: Mastering Web Application Development with AngularJS. The factory method is the most common way of getting objects into AngularJS dependency injection system. It is very flexible and can contain sophisticated creation logic. Since factories are regular functions, we can also take advantage of a new lexical scope to simulate "private" variables. This is very useful as we can hide implementation details of a given service." With the factory you actually create an object inside of the factory and return it. With the service you just have a standard function that uses the this keyword to define function. With the provider there’s a $get you define and it can be used to get the object that returns the data. Lazily Instantiated: If the service is not injected it won't be instantiated ever. So to use it you will have to inject it to a module. Singleton: If it is injected to multiple modules, all will have access to only one particular instance. That is why, it is very convenient to share data across different controllers. This types of services follow the factory design pattern. The factory can be thought of as a central place that creates new objects or methods. This does not only produce singleton, but also customizable services. The .service() method is a factory that always produces the same type of service, which is a singleton. There is no easy way to configure it's behavior. That .service() method is usually used as a shortcut for something that doesn't require any configuration whatsoever. For short and simple explanation refer https://stackoverflow.com/a/26924234/5811973. For detailed explanation refer https://stackoverflow.com/a/15666049/5811973. Not the answer you're looking for? Browse other questions tagged angularjs or ask your own question. AngularJS : Factory and Service? AngularJS - different ways to create controllers and services, why? AngularJS : What is a factory? Should I use `this` or `$scope`?